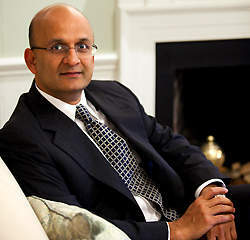 BOSTON, MA--(Marketwire - May 4, 2010) - Nitin Nohria, the Richard P. Chapman Professor of Business Administration at Harvard Business School (HBS), will become the School's 10th dean, President Drew Faust announced today (May 4). Nohria succeeds Jay Light, who in December announced his plans to retire at the end of the 2009-10 academic year after five years as dean and four decades of distinguished service on the HBS faculty. "At a pivotal moment for Harvard Business School and for business education more generally, I'm delighted that Nitin Nohria has agreed to lead HBS forward," Faust said. "He's an outstanding scholar, teacher, and mentor, with a global outlook and an instinct for collaboration across traditional boundaries. He has an intimate knowledge of the School and a strong appetite for innovation. He cares deeply about the School's commitment to both rigor and relevance -- to serious scholarship that has a powerful impact on practice. And he's a person who not only studies leadership but embodies the qualities of a leader in how he engages people and ideas, in how he thinks about organizational change, and in how he sees the consequential challenges ahead." "I am grateful to President Faust for this opportunity, and I feel humbled and privileged to follow many outstanding deans, including Jay Light," Nohria said. "I feel a profound sense of responsibility for continuing Harvard Business School's proud legacy of groundbreaking ideas and transformational educational experiences. With business education at an inflection point, we must strive to equip future leaders with the competence and character to address emerging global business and social challenges. As we enter our second century, I look forward to working with the School's faculty, staff, students, and alumni to forge a vision for Harvard Business School that will enable it to remain a beacon for business education for the next 100 years." "Nitin Nohria will be a wonderful dean of Harvard Business School," said Light. "He is widely respected within our extended community as a perceptive scholar of leadership and as a thoughtful and able academic leader. He believes deeply in the distinctive mission of the School and its role in the world. He will effectively carry forward the objectives and the strategies that make this institution a very special place." Nohria received his bachelor of technology degree in chemical engineering in 1984 from the Indian Institute of Technology, Bombay, which awarded him its distinguished alumnus medal in 2007. He received his Ph.D. in management in 1988 from the Massachusetts Institute of Technology's Sloan School of Management, where he earned the outstanding doctoral thesis award in behavioral and policy sciences. He joined the HBS faculty as an assistant professor in 1988, was appointed associate professor in 1993, was promoted to tenure in 1997, and became the Richard P. Chapman Professor of Business Administration in 1999. His current academic interests include the theory and practice of leadership, the study of human motivation, the analysis of management practices critical to corporate success, and the strategic and organizational challenges of globalization. He has co-written or co-edited 16 books, and is author of more than 50 articles and dozens of teaching cases and notes. His most recent book, "Handbook of Leadership Theory and Practice" (2010, co-edited with Rakesh Khurana), reflects a colloquium he organized as part of the HBS centennial in 2008 to stimulate serious scholarly research on leadership. Other recent books have explored how leaders from different backgrounds rose to power in American business ("Paths to Power," 2006, with Anthony Mayo and Laura Singleton); what management practices differentiate successful business organizations ("What Really Works," 2003, with William Joyce and Bruce Roberson); what can be learned from the decline of industrial firms in the last quarter of the 20th century ("Changing Fortunes," 2002, with Davis Dyer and Fred Dalzell Jr.); what basic drives shape human motivation and choice ("Driven," 2001, with Paul Lawrence); and how ambition shapes the making of great achievers ("The Arc of Ambition," 2000, with James Champy). His 1997 book, "The Differentiated Network: Organizing Multinational Corporations for Value Creation," won the Academy of Management's George R. Terry Book Award granted annually to the book judged to have made the most outstanding contribution to the advancement of management knowledge. Nohria has served in a series of senior roles at HBS over the years: chair of the organizational behavior unit from 1998 to 2002, director of the division of research in 2003 to 2004, and senior associate dean for faculty development from 2006 to 2009. He became co-chair of the HBS Leadership Initiative in July 2009, and sits on the executive committee of the University's interfaculty initiative on advanced leadership. Nohria has taught across the Business School's M.B.A., doctoral, and executive education programs. He is past head of the required first-year "Leadership and Organizational Behavior" course, and he co-directed the team that designed the required first-year course on "Leadership and Corporate Accountability." He recently taught in such executive education programs as "Building a Global Enterprise in India" and the "New CEO Workshop." A dedicated mentor to many HBS doctoral students over the past two decades, he also taught for years in the interfaculty Ph.D. program in organizational behavior and chaired HBS task forces on case writing and course development, as well as the leadership curriculum. Earlier this year, he was one of four instructors from Harvard Schools who co-designed and taught a January term workshop on "Faith and Leadership in a Fragmented World." In a letter to the HBS community announcing the appointment, Faust said she had "benefited from an extraordinary outpouring of thoughtful advice during the course of this search," and she expressed her gratitude to "the many [people] who shared helpful views along the way -- not just about possible candidates for dean, but about the larger issues and opportunities faced by business schools in general and ours in particular." She also thanked the faculty advisory group that assisted with the search. "The search has been an invaluable education for me," she said, "and has given me great confidence that HBS moves forward from a position of strength, buoyed by a remarkably engaged and energetic community of faculty, students, staff, and alumni." Founded in 1908 as part of Harvard University, Harvard Business School is located on a 40-acre campus in Boston. Its faculty of more than 200 offers full-time programs leading to the M.B.A. and doctoral degrees, as well as more than 140 open enrollment and custom executive education programs. For a century, HBS faculty have drawn on their research, their experience in working with organizations worldwide, and their passion for teaching to educate leaders who have shaped the practice of business around the globe.